Funny, to see ‘man’ here when within the context of the doubled interior life, the word ‘woman’ feels truer, and perversely more traditional. It is neither incidental nor un-meaningful that Meshes of the Afternoon is written and directed by a woman, or that Geissler, on the first page of her ‘novel,’ clarifies that because ‘from now on, [we] are [her],’ we are female. (‘Please,’ she urges, ‘don’t forget that, because it’s important in places.’ Several times, ‘we’ are harassed, belittled, and otherwise gaslit by male workers and superiors, offering further proof that Seasonal Associate is factual, and not fictional.) Meshes of the Afternoon uses, as its motifs, a key, a knife. Work itself is a killing knife; and it is also, for the purpose of facilitating entry into normal, dismal adult life, a key. ‘Is this a matter of life and death?’ Geissler enquires, in the very first line. ‘I’ll say no for the moment, and come back to the question later.’ Work, ergo the split-brained disassociation we experience under capitalism, is for most of us a matter of life and death. It is the fact that it is necessary for most of us in order to live that makes it feel especially like dying. Roughly one month before reading Seasonal Associate, I quit my job in the capital city and moved to a smaller one, with the reason being capital-as-in-capitalism, as in cold, hard cash. The life and the context that I had enjoyed since I was eighteen, never not precarious financially or psychologically, tipped into bona fide non-viability. That summer, which felt like the hottest summer since records began, ensured that nothing natural looked or felt green, but instead looked torrefied, sick. I could not make myself take that kind of work, the killing kind of work, to stay. ‘From now on,’ Geissler clarifies a few lines later, ‘that which kills us is your constant companion: that much I can say.’ I have killed, in leaving office hours behind, the thing that killed me. Who or what is my companion now? In Seasonal Associate, it is apparent that work offers definition, even if that definition is in opposition to the worker’s hatred of the job. What was meant to be a temporary measure for the author becomes all-consuming: the weight of it crushes her into a new, strange shape. The book is, mirroring the work, repetitive enough to be hypnotic. It was 2010 when Geissler worked at Amazon, at which time nobody was interested in the manuscript for Seasonal Associate. In 2015, in The New York Times, a story ran alleging that the company appeared to be ‘conducting a little-known experiment in how far it can push white-collar workers, redrawing the boundaries of what is acceptable,’ and the value of an exposé of mega-corporate working practices—and of Amazon’s working practices especially—became clear. ‘So to return to the question from the beginning,’ Geissler writes on Seasonal Associate’s eightieth page, ‘about whether it’s a matter of life and death, I’m now saying clearly: Yes, it is.’ The rest of us—our eyes opened to the realities of what Amazon’s founder called, unwittingly express-delivering to the media the rope with which to hang him, a ‘soulless, dystopian workplace, where no fun is had and no laughter heard’—are ready now for her to say it, too. 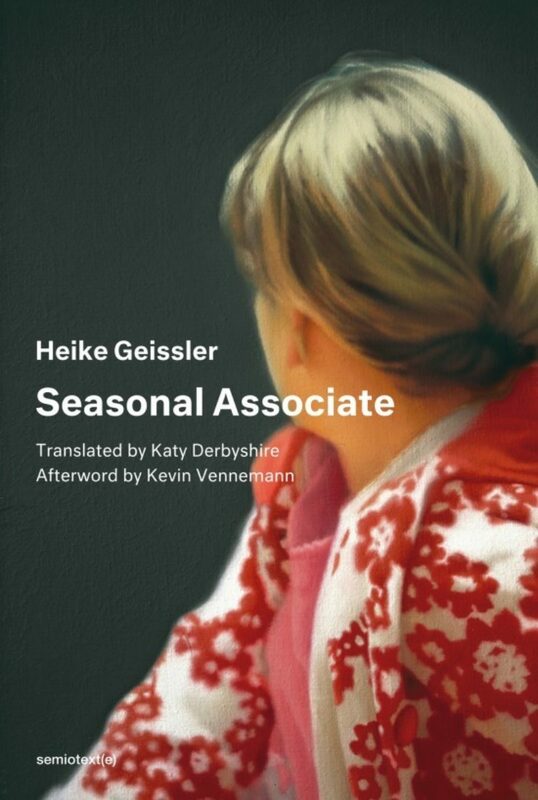 Seasonal Associate by Heike Geissler is published by Semiotext(e).